Come Thursday and the week starts to look like a really long drag. For those who go to work, Friday evening touchdown to the base looks blurred and distant; and for those who remain back home, the weekend fun appears like a distant dream. Just like most north Indians, I too cook vegetables, lentils and chapati on most days of the typical week. However to break the tiring monotony and to infuse some energy I decided to cook a south Indian meal this afternoon. My little one simply loved the dosa and nariyal chutney…and the husband’s verdict is still awaited. Since the sambhar (my friend Sandhya’s recipe) and chutney (my version- with a twist) turned out really well, here’s is the recipe for you to try. Trust me, on a rainy day, nothing tastes better than a bowl of steaming hot sambhar, coconut chutney and crisp dosas…..WOW!! Preparing the dry masala is the most crucial and important step in preparing good sambhar, for it is this masala that lends the authentic taste. In a pan, dry roast the grated coconut till the water vaporizes. Then add asafoetida, sambhar masala (I use Everest brand), coriander and chilli powder and roast for another minute -At this stage you’ll love the aroma these spices release and later the magic this masala does to the sambhar. For the Tadka, heat some oil in a wok, add mustard seeds (rai), let them crackle, follow it up by curry leaves and whole red chillies. Pour the tadka over the sambhar. 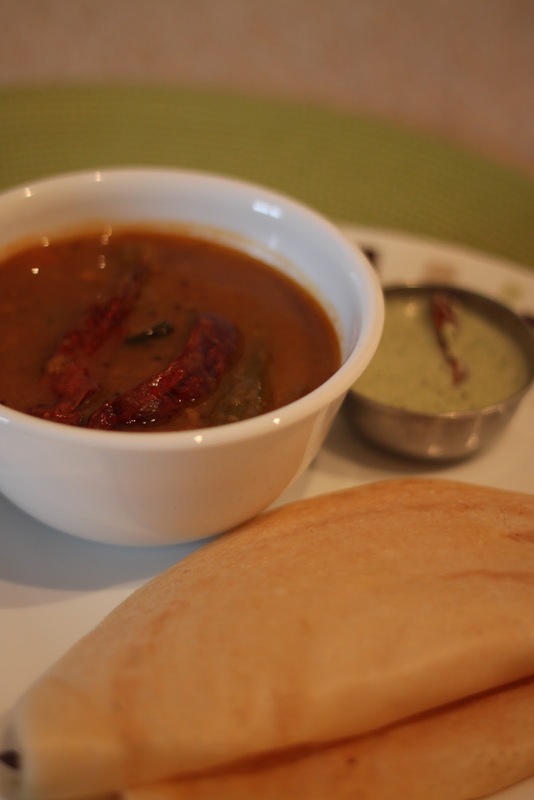 Your sambhar is ready – enjoy the steaming hot smabhar with crisp dosas and coconut chutney! Reduce the flame to medium, take some mix in a ladle and pour it in center, start spreading inside-out in a circular fashion till you can easily manage. Let it cook. The dosa will start leaving the sides. As that happens, flip it over and cook on the other side. Important things to keep in mind are : the tawa should be well heated before you start making dosa, the oil should be applied in a thin film (oil applied one time will last you at least 4-5 dosas, after which you can re-apply), and thin dosas cooked on low-medium flame turn out crispy.